In 1952 Republicans chose World War II hero General dwight d. eisenhower as their nominee for president. Eisenhower chose Nixon as his running mate. The campaign encountered a crisis almost immediately. In September 1952, several newspapers disclosed that Nixon had received financial support from a secret fund raised by wealthy California business owners. This offense was viewed as shocking, and many people called for Nixon to withdraw from the ticket. Instead, he took the offensive and pleaded his case on national television, delivering what came to be known as the "Checkers Speech." Nixon maintained his innocence, disclosed his financial situation to show he was in debt, and pointed out that his wife did not have a mink coat but rather wore "a respectable Republican cloth coat." He went on to say that a supporter in Texas had given the family a gift, a dog named Checkers, and that "the kids love the dog, and … we're going to keep it." The public's response was overwhelmingly positive and Nixon remained on the Republican ticket. Nixon had discovered the enormous power of television and had utilized it to his advantage, reaching a large audience without the need to endure press scrutiny. Eisenhower and Nixon received 55.1 percent of the popular vote in the 1952 election. Nixon served two terms as an unusually active vice president, honing his foreign policy skills during trips to 56 countries. Among the most famous of these journeys was a 1959 visit to Moscow, where he engaged in the celebrated Kitchen Debate with Soviet leader Nikita Khrushchev. The two men informally debated the merits of capitalism versus Communism while they toured the kitchen of a model home at a U.S. fair. 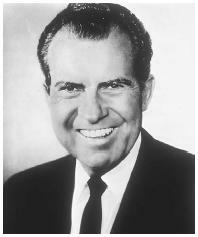 Nixon's willingness to confront critics and his ability to turn adversity to his advantage earned him praise and acclaim. Nixon also opened negotiations with the Communist government in the former Soviet Union. He initiated the process known as détente by holding three summit meetings with Soviet leader Leonid Brezhnev. His efforts culminated in a breakthrough agreement in 1972 limiting the use of antiballistic missiles.One major goal that eluded Nixon in foreign policy was a quick end to the Vietnam War. After promising "peace with honor" during his campaign in 1968, he saw the war continue through his first term. Ambrose, Stephen E. 1989. Nixon: The Triumph of a Politician, 1962–1972. New York: Simon & Schuster. ——. 1987. Nixon: The Education of a Politician, 1913– 1962. New York: Simon & Schuster. Brodie, Fawn M. 1981. Richard M. Nixon: The Shaping of His Character. New York: Norton. Kutler, Stanley I., ed. 1998. Abuse of Power: The New Nixon Tapes. New York: Simon & Schuster. Mankiewicz, Frank. 1973. Perfectly Clear: Nixon from Whittier to Watergate. New York: Quadrangle Books. Morgan, Iwan. 2002. Nixon. New York: Oxford Univ. Press. Nixon, Richard M. 1990. In the Arena: A Memoir of Victory, Defeat and Renewal. New York: Simon & Schuster. ——. 1978. R.N. : The Memoirs of Richard Nixon. New York: Grosset & Dunlap. "Twenty-Five Years After Watergate" (special edition). 2000. Hastings Law Journal 51 (April). White, Theodore H. 1975. Breach of Faith: The Fall of Richard Nixon. Atheneum Publications. Wicker, Tom. 1991. One of Us: Richard Nixon and the American Dream. New York: Random House. Wills, Garry. 1969. Nixon Agonistes: The Crisis of the Self-Made Man. Boston: Houghton Mifflin. Cold War; Communism; Ervin, Samuel James, Jr.; Executive Privilege; Independent Counsel; Jaworski, Leon; Mitchell, John Newton; New York Times Co. v. United States; Watergate.